It's one of your greatest fears. It's something we all dread to think about, whether it's about a fragile loved one who lives alone or yourself in years to come. You fall down hard in the middle of the night. You break bones, you're unconscious and there's the very real chance that no one will find you in time to save your life. That's exactly what happened to a 67-year-old man in Norway, who fractured bones in his face when he fell in his bathroom in the middle of the night. His family believes he fainted. No one else was there, yet he was saved by the Apple Watch 4 he was wearing. This incredible, life-saving tech could also save your life. It's called Fall Detection. It's a deceptively simple app that automatically alerted that man's nearby emergency services of his location and his situation when he didn't respond to the watch's alerts. Apple Watch 4's fall detection saves lives. It's ingenious in its simplicity. If your watch senses that you've had a hard fall, the watch itself taps your wrist and shows you an alert like the one below. You will hear a loud alarm. You can swipe SOS for it to alert emergency services or let it know that it's a false alarm. It will do that work for you if you cannot respond. It will countdown one minute if you are not moving. Then it will call emergency services with an automated message and your location. It will alert your emergency contacts after that. Note: Keep reading for step-by-step instructions to set up Fall Detection. You have to set up three things on your Apple Watch series 4 for it to alert emergency services when you fall. You can start by setting up Wrist Detection. 1. Open Settings then tap Passcode on your Apple Watch. Check to see that Wrist Detection is on. 2. You can setup Fall Detection by inputting your age when you're setting up your watch or the Health app. It will automatically be turned on if you're 65 or older. 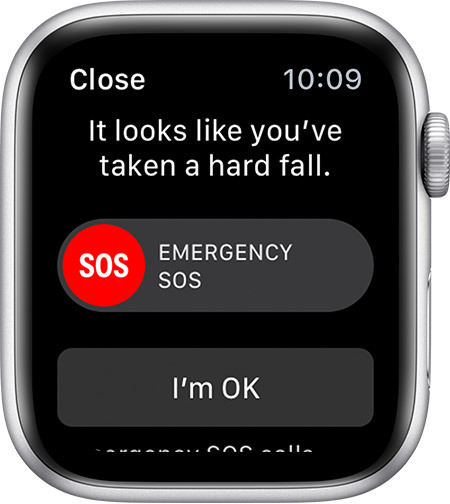 If not, open your Apple Watch app on your iPhone, then tap My Watch, Emergency SOS and then turn on Fall Detection. 3. Setup your Medical ID. Start by tapping on the Health app on your iPhone, then Medical ID and Edit. Input your birthday, emergency contacts and medical information. The Apple Watch was built with the intention of being a health and fitness gadget. Most wearable devices can take our pulse and measure our blood pressure. Apple took this to the next level when it introduced a new feature this year. In this episode of Komando on Demand, Kim takes a look at the Apple Watch Series 4 and its new ability to take an ECG. But how reliable is it? Kim talks to Sergei Shatillo P.A., who works with heart transplant recipients at the Mayo Clinic, about common heart ailments and how the Apple Watch Series 4 can impact people's lives. The Apple Watch is a marvel of technology and has taken what once was only a sci-fi fantasy and turned it into a reality. There are so many things that little device can do that you might be missing some of the more incredible uses. I'll fill you in so you can become an expert. Tap or click to how to set up Apple Watch features.